Big Brother is now on its twentieth season and has packed the house with some really interesting house guests all competing for the grand prize of half a million dollars. The new season premiered on June 27 and is centered around the concept of social media influence. The way this works is each week, viewers of the show vote on a series of questions about the contestants, and the one whose name comes up the most often is considered the “top trending” guest and awarded a “power app” that gives them an advantage in the game. The contestant who is “least trending” gets a “crap app” which is acts as a punishment. As you can tell, social influence is imperative in this season. It’s common for Big Brother contestants to hand over control of their social media accounts to friends and family throughout the duration of the show so they can post on their behalf when they have no access to their own account. Contestants of Big Brother have also seen huge spikes in the amount of followers that they have on social media due to being on the show, so having an active account helps in that way as well. However, a handful of the contestants seemingly haven’t caught on to this strategy yet and have private social media accounts. Our prediction is that the contestants with public and managed social media accounts will do better on the show this season, especially with the focus on social influence this season. 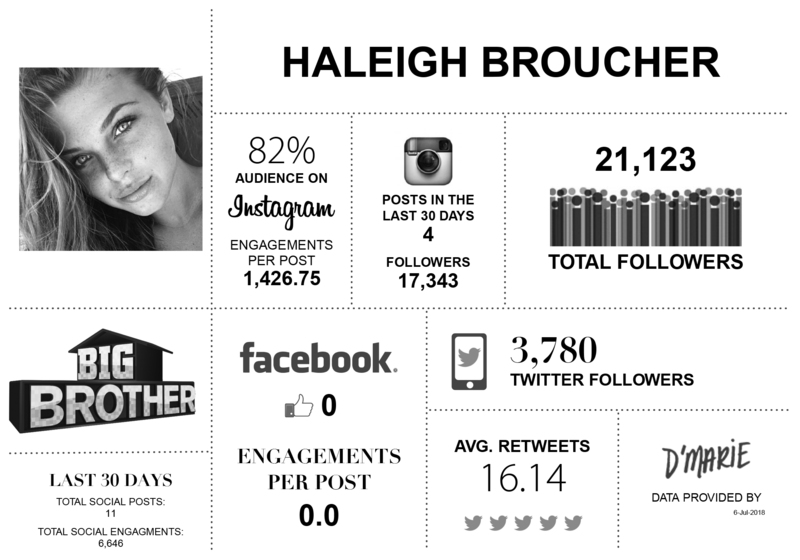 Here is a list of the contestants in order of their social media influence. JC is a professional dancer in West Hollywood, CA, as well as the most followed person on this season of Big brother (so far). Do you think he’ll be able to hold this top ranking for much longer? You can find him on Instagram and Twitter. Haleigh is the youngest cast member of Season 20. She’s a twenty-one year old college student from Texas who went into the game with a following to begin with. She posts lifestyle and fitness photos and is currently having her page managed while she’s away. You can find her on Instagam and Twitter. Angela is a 26-year-old fitness model from Playa Vista, CA. She’s always been athletic and likes to pretend not to be when she goes out on first dates and then surprise her date. We’re rooting for her for that very reason. You can find her on her private Instagram and Twitter. Her private Instagram can be found here. Lastly, two contestants of this season; Steve Arienta and Brett Robinson don't have any social media at all. Steve is a former undercover cop which we think is the reason behind his complete lack of social media. We're interested in how this will effect their performance in the show, but I guess we'll just have to wait and see!